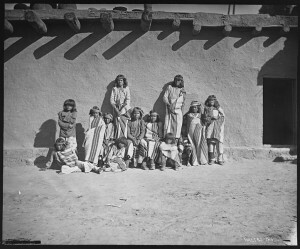 The Zuni are one of the 19 Pueblo tribes of what is now known as New Mexico. The Zuni tribe lives along the Zuni River in the northwestern corner of the state on a reservation of roughly 450,000 acres. Archeologists believe Zuni history began well before 2500 B.C. when the tribe moved into the Southwest as big game hunters. Between 2500 B.C. and 700 A.D. the Zuni Indians made their first attempts at agriculture and hunted smaller game. Historians believe it was during this period they started making pottery and weaving baskets. By the 1500s, the tribe’s agriculture thrived thanks to their ingenious systems of irrigation that fueled their fields, allowing the Zuni to grow maize and wheat. The population grew and the tribe constructed plaza-style villages. Outside forced first threatened the tribe in 1539. According to the official Zuni tribe website, Spaniard Fray Marco de Niza left Mexico with a man named Estevan and came across a Zuni village. When Estevan demanded turquoise and women, he was executed by the Zuni Indians. de Niza turned tail and retreated back to Mexico, but a year later, Spaniard Francisco Coronado returned to Zuni lands with a large army, hoping to exact revenge on de Niza’s behalf. The Spanish were driven out by the tribe and Coronado narrowly escaped with his life. It is believed six of Coronado’s men were left behind. Instead of executing the attackers, the Zuni allowed the men to live among them peacefully and they happily lived out their lives among the Zuni people. Throughout Zuni history, the tribe has maintained their cultural beliefs and traditions. With the help of a linguist from Arizona, tribal elders were able to put the Zuni tongue in writing for the first time. Prior to that, the language was passed down verbally from tribal elders and parents. The tribe continues to live in their ancestral lands in New Mexico, although many of the oldest villages have either been lost to time or are now historical sites. Thousands of people visit the ancient villages every year to learn more about Zuni history and get an idea of what life was like for the tribe thousands of years ago. Copyright © Zuni Indians 2019. All Rights Reserved.